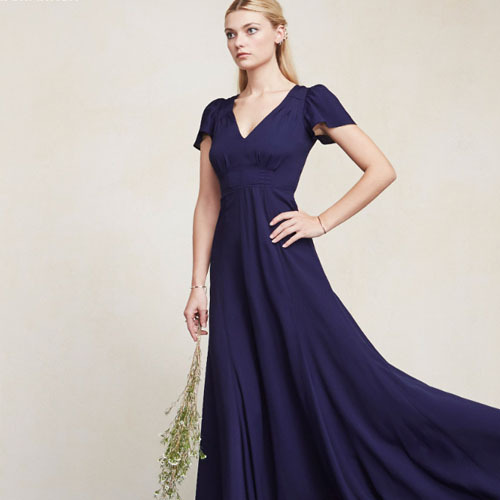 This dress is everything you could possibly want from a floor-length formal evening gown; ever so slightly ruffled capped sleeves, a full skirt, flattering cut with fitted waist and V neckline, and an elegant back. Perfect for weddings, formal balls, or, you know, a red carpet event, this style comes in a few different colours and floral prints. Reformation is a certified B Corporation LA-based American brand that make limited edition collections using vintage and recycled fabrics in their own downtown LA sustainable factory. 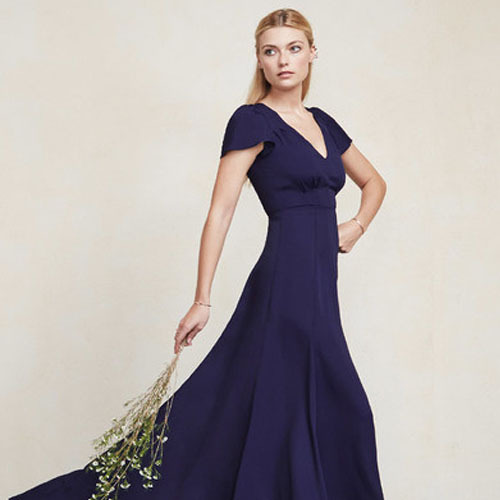 Their pretty, feminine dresses are particularly noteworthy, and while the exact pieces are always changing because they only have limited amounts of the unique fabrics that they use, you can count on the fact that they will release similar styles and cuts even if a specific piece you fell in love with has sold out. Reformation clothing is made from three different types of fabric: new but sustainable fabrics, rescued deadstock fabric from other fashion lines that over ordered, and repurposed vintage clothing. From their heat-reflecting energy saving roof and use of renewable energy, to the recycled hangers in their shops and 100% recycled packaging for every order that they ship, sustainability is a key concern for Reformation, and they try to pay attention to every detail of the manufacturing and sale process. Their factory was designed and built to be as green and eco-efficient as possible, minimising their waste, water, and energy footprints. They use LED lighting and renewable energy suppliers, and use an innovative laundry-to-irrigation system to use water from their washer to irrigate their garden. They even celebrate staff birthdays by planting a tree through a donation to the charity TreePeople, which supports urban tress in LA. By cutting out the middleman and producing all of their own clothes, Reformation can guarantee safe working conditions and fair pay for everyone who makes their clothes. Most of their hourly workers are paid above minimum wage, and over half are paid above the LA living wage threshold. They provide health benefits to all of their full time staff, including the manufacturing team, and invest in people by providing on-the-job training and opportunities for growth. They also provide employees with one paid day off a month to volunteer and have a positive impact on their communities.